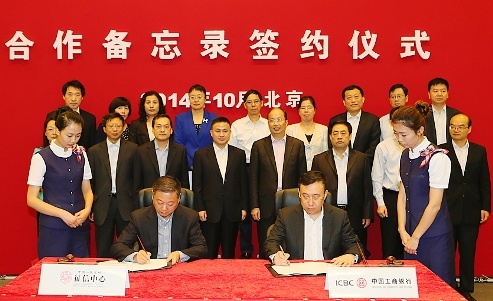 On October 11, 2014 a Memorandum of Business Cooperation on the Account Receivables Financing Service Platform (“Memorandum”) was signed between the CCRC and Industrial and Commercial Bank of China (“ICBC”). The ceremony was attended by Pan Gongsheng, Deputy Governor of the PBC, and Yi Huiman, President of ICBC. The agreement was signed by Wang Xiaoming, Head of the CCRC and Secretary of the CCRC Party Committee, and Qiao Jinsheng, General Manager of the Corporate Banking Department of ICBC on behalf of the CCRC and ICBC respectively. Yang Ruimao, Senior Advisor of the General Executive Office of the PBC; Ji Zhihong, Director-General of the Financial Market Department of the PBC; Wang Xiaolei, Deputy Director-General of the CCRC; and representatives from the head office departments and branches of ICBC were also in attendance at the signing ceremony. The signing of the Memorandum is a distinct sign of the determination of the CCRC and ICBC to establish a comprehensive strategic partnership along the principles of long-term cooperation and mutual support. The CCRC will continue to enhance its building of various financial infrastructures including the Platform, as well as its collaborations with ICBC in areas such as business research and Platform improvement in order to meet market demands and better serve the needs of SME financing.